Dissolve sugar in lemon juice. Shake with ice and strain into a coupe glass with a "Spanish Comb" ice shell. A few Wednesday nights ago, I got home from my shift at work and picked up Beachbum Berry's Sippin' Safari. There, I spotted the Aku-Aku Gold Cup and decided to take on the late night arts and crafts challenge of making an ice shell. After crushing up ice in a Lewis Bag with a mallet, I tried a few approaches. Beachbum Berry recommends building the comb in a coupe glass and nudging the shell over to continue building it; I was able to make the initial shell but separating it from the glass seemed futile with out running hot water along the outside. What did work was a tip that Andrea had pointed out to me perhaps on SeriousEats by making it in a hand juicer. One of my two squeeze juicers seemed to make a decent shape after freezing and freeing it from the press. From there, I placed the curved ice disk along the side of a coupe glass and built out the base of the shell with another round of crushed ice before placing it in the freezer for a final harden. 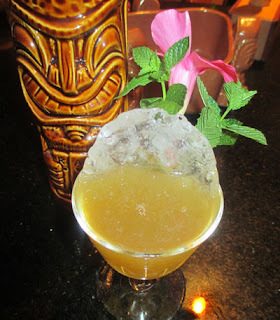 This Gold Cup variation was created at the Aku-Aku restaurant in Las Vegas' Stardust Hotel circa the 1960s. Once fully built, the Aku-Aku Gold Cup shared lemon and dark rum aromas underneath the mint and floral notes from the garnishes I added. Soon, honeyed citrus and caramel flavors filled the sip, and the swallow offered dark rum notes spiced by ginger and clove.